Low growing and hardy, these small flowering plants for borders have a graceful spread and cheerful flowering habit. They bring unity to mixed garden bed borders and are ideal as groundcovers. Verbena is quite drought-tolerant, easy to grow and will give your garden a touch of romance. Its spreading or trailing habit makes it ideal for rockeries and borders. Plant in full sun and ensure good drainage. Verbena is often marketed as an annual plant, but is in fact a perennial and with good care plants will last for several years. This Australian native daisy flowers in pink, white and purple. It has a compact spreading habit, good flower form, size and robust foliage. These plants are great for combination planting. Trim lightly after flowering to encourage new flowers. These pretty, rose-shaped flowers come in a huge range of bright colours. This semi-succulent is low maintenance, water-saving and fast growing. They love the heat and bear masses of flowers from spring to autumn. Growing little more than 10cm, it’s also great in pots. Plant in full sun and protect from frost. Choose from shades of apricot, magenta, orange, pink, red, white and yellow. Free flowering over the warmer months, petunias prefer a sunny position. Petunias are something really special when mass planted in generous bands of colour at the front of beds and borders. Dead head regularly to encourage further flowering. 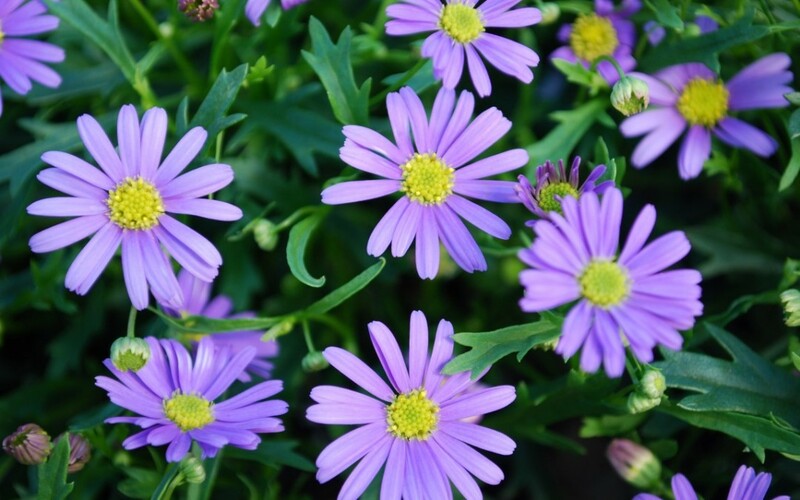 This tough, heat tolerant plant produces a carpet of vividly-coloured, daisy-like flowers in spring and summer. It’s fabulous as a nature strip plant and a tough perennial groundcover. Plant in full sun. Available in warm shades — yellow, orange and red. CONTRIBUTOR: About the Garden Magazine http://aboutthegarden.com.au/ is a free seasonal Australian publication that showcases practical gardening advice on colour and food for your garden spaces. With easy to follow step-by-steps we can help you get your next project started!